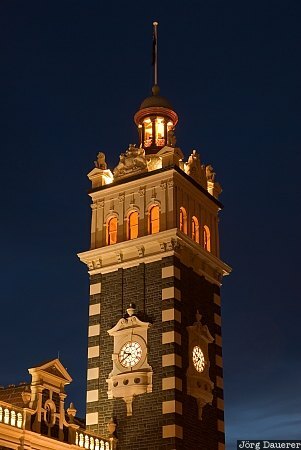 The floodlit Dunedin Railway Station, one of the landmarks of New Zealand's South Island at the blue hour after sunset. Dunedin is in Otago on the south island of New Zealand. This photo was taken in the evening of a cloudy day in November of 2008. This photo was taken with a digital camera.